For a start we can use some basic tools that are easily available. But as your gain expertise its better to go for some specialised tools that help you save time and improve your productivity. 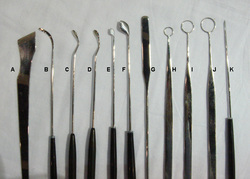 Our pearl farming surgical tools are made in stainless steel and come in many different sizes and variations. Not all styles and tools are photographied but are available upon request. If you are interested in inquiring more information, or would like to order, please contact us.